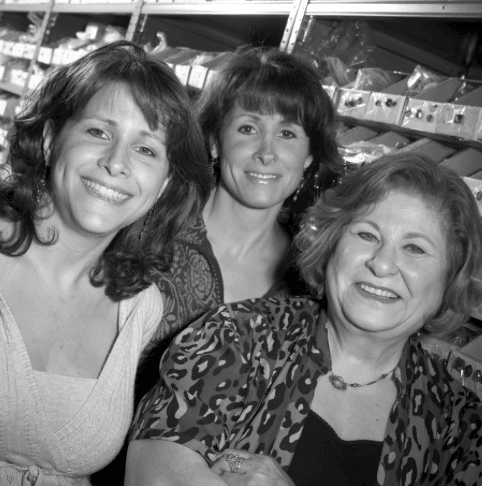 Over 35 years ago Anne Koplik Designs was born on the dining room table of Anne’s Long Island home, with a mission to create jewelry to make women feel beautiful. One of Anne’s greatest joys is that she works side by side with both of her daughters Jill and Kara. Together they oversee all aspects of the business. She also loves that as she designs each piece, her golden retriever, Sonny, relaxes by her feet, on the purple floors that she installed throughout her workshop. Purple has always been one of Anne’s favorite colors. Anne Koplik jewelry collections are proudly handcrafted in her Brewster, NY studio. Anne and her team of skilled American artisans handcraft vintage inspired jewelry with crystals from Swarovski®, lead/nickel/cadmium-free metals, solid brass, surgical steel, hand mixed and hand applied enamels, European glass and Mother of Pearl. Each piece of jewelry is created for women who want to experience beautiful designs and have them for their own, at an attainable price. All of the pieces are handcrafted with time-tested techniques that no foreign assembly line or machine can match. Our work endures because we use only the finest materials. Anne Koplik jewelry has been the exclusive provider of jewelry for Dancing with theStars since Season 5.